Business-to-business (B2B) companies are facing anemic growth. To combat this, they've focused intensely on increasing market share, with the majority turning to mergers and acquisitions (M&A), as demonstrated by global M&A activity hitting all-time highs in 2015. But relying on M&A is just a Band-Aid. If B2B companies are to achieve organic growth, they must win customers from their competitors and help their customers grow, generating more business for themselves. This approach requires a differentiated sales strategy -- one that is advisory, is tailored to each customer and provides valuable insights. Most B2B companies have failed at this. 53% of B2B customers strongly agree that their supplier is a trusted adviser. According to CSO Insights, just 58% of sales reps are meeting their sales quotas, while Gallup's latest research shows that 71% of B2B customers are at risk of taking their business elsewhere. What's more, approximately half of B2B customers (47%) don't strongly agree that their sales or account teams are trusted advisers. Incorporate advanced analytics into market research activities. Integrate analytics personnel into sales and account management structures. Build reliable customer intelligence. Data- or analytics-based insights are only as valuable as the questions they answer and the willingness of the recipient -- the customer -- to listen to and trust those answers. To position sales activities for success, B2B leaders need a clear understanding of customers' unique needs, how customers perceive their company and its products, and how open customers are to receiving analytics and advice. For example, Gallup conducted an audit for a global manufacturer that was struggling to grow key customer accounts. Through strategic account stakeholder interviews, win/loss studies and internal customer account data analysis, the company gathered a clear picture of the roadblocks to its growth. The manufacturer discovered its customers felt that its sales and account management personnel understood their needs and considered them trusted partners. But the account team rarely brought the customers new ideas or innovations, so customers felt the company wasn't serving as a strategic partner. Customers wanted insights and advice based not only on current business conditions but also on future market conditions and the opportunities they presented. To solve this problem, the manufacturer created a joint "innovation lab" with its customers that sought to combine their expertise to identify, design and test innovative product solutions together. Incorporate advanced analytics into market research activities. The next step is rethinking your market research strategy. Best-in-class analytics-based sales forces have moved from a traditional market research approach to an advanced analytics-based approach. Research focus: B2B companies should shift their research approach from a primary emphasis on understanding customers' business economics and financial performance to an in-depth understanding of the customers' customers -- the end consumer of their products. Data curation: B2B salespeople and market research teams still rely too much on traditional data sources -- for example, operational data such as revenue and costs -- when trying to understand customers' businesses. However, with the growing digitalization of data, alternative data sources -- such as social, geospatial and behavioral economic data -- can provide unique insights into relevant customer and end-consumer behaviors. Analysis: B2B companies should transition their analysis from historical analytics that look at "what has happened" to predictive analytics of "what is likely to happen and why." Integrate analytics personnel into sales and account management structures. The days of B2B success from a single salesperson or account manager are long gone; effective B2B relationships take a team effort. However, most B2B organizations have not evolved their sales and account management structures to meet today's requirements. The third component to building an analytics-based sales strategy is integrating sales, account management and data science personnel to create a well-aligned account team that better understands customers' needs and how to present valuable insights to solve crucial challenges. For B2B organizations with a market insights or data science division, this unit often sits within a centralized structure, reporting to the CMO or CDO chain of command and receiving analytics directives through top-down communication or regularly scheduled cross-line-of-business meetings. Though this arrangement is convenient for managing resources, it often means that data scientists remain at arm's length from current and prospective customers. Best-in-class organizations are rethinking their team structures and resource planning, making sure that analytics personnel play a growing role. As customers become more sophisticated, B2B sales and account teams must follow suit, or organic growth will remain elusive. B2B leaders must adapt. They must move beyond product and price to advice -- offering valuable knowledge, providing unique insights and helping customers create new opportunities. Combining customers' feedback with alternative data sources provides forward-thinking B2B companies with a distinct competitive advantage -- but the only way to get there is with a comprehensive, analytics-based sales strategy. David Leonard, Partner, leads Gallup's Advanced Analytics Consulting Practice. 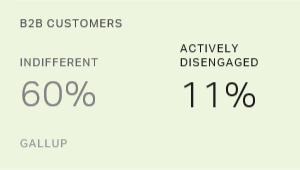 71% of B2B customers aren't engaged. To benefit from the performance advantages of predictive analytics, leaders require the right data, analysis and culture. Companies can take specific actions to build stronger account teams and get much more business from existing customers. There are specific actions B2B companies can take to build stronger account teams. A big one: Position salespeople as consultants.